Crayola Paint Maker Only $12 + FREE Super Saver Shipping! You are here: Home / Great Deals / Amazon Deals / Crayola Paint Maker Only $12 + FREE Super Saver Shipping! Have a little one who loves to paint? I have the perfect gift idea for you! 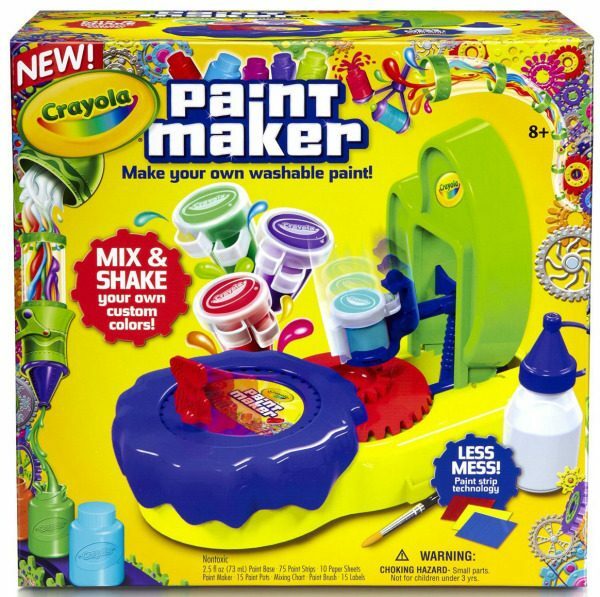 Grab the Crayola Paint Maker for just $12 + FREE shipping with Super Saver Shipping! This set is so neat because you can mix paints to make your own colors! My daughter would LOVE it! Creating your own custom paint colors is fun, fast, and easy with the Crayola Paint Maker. This interactive kit comes with a mixing guide to help you create 15 unique paint colors–or even make your own. Name your color creations using the included labels and clean up easily with Crayola’s paint strip technology, designed to prevent mess. The Crayola Paint Maker folds up easily for convenient storage and is designed for kids ages eight and up.